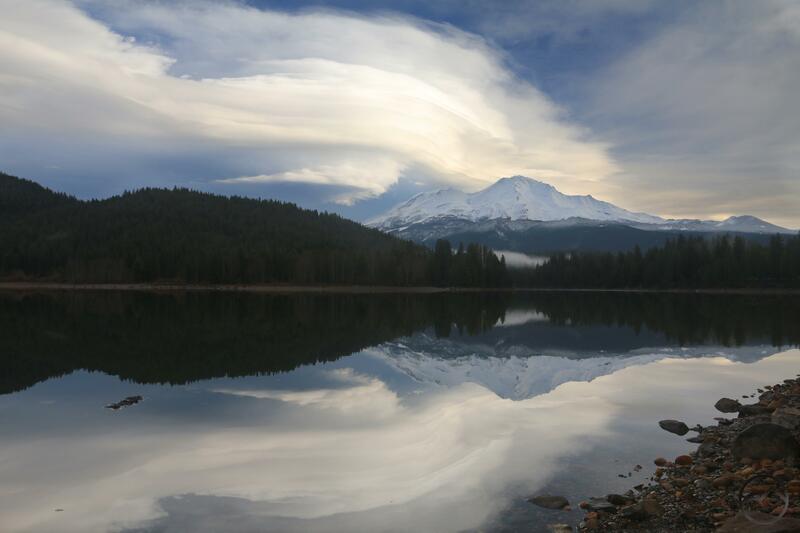 One of the pleasures of living near Mount Shasta is the opportunity to observe the lenticular clouds that often form around the mountain. Mount Shasta is so massive, high and solitary it disrupts the air currents that flow around it and frequently develops large, oddly shaped clouds. Sometimes they appear on or above the mountain while other times they orbit nearby the great volcano. These formations form near other prominent mountains but Mount Shasta is particularly noted for the frequency and size with which they appear. The clouds enhance what is an already amazing spectacle by adding unusual forms to the mountain’s appearance. Any time one is fortunate enough to capture the mountain with a lenticular, it is an exciting opportunity. Conversely, any time a one develops and circumstances prevent going to a good point to observe the mountain and its clouds it is supremely frustrating. The following is a gallery of some of the more interesting lenticular clouds I have encountered around Mount Shasta. Thanks! These are especially fun to capture! You have some real beauties in this set! Thanks Jackson! I appreciate it! Well…the said news is that this is not really lenticular season. They usually show up in spring and fall, when weather patterns are changing more frequently. They can show up in summer but it is much more unusual. Moreover, even during the seasons when they are more common, there is no way to predict when they will and won’t show up. It is all a matter of timing and being in the right place at the right time.